Every now and again, I get a craving for this ethnic dish. Kielbasa sausage is very common here on the Prairies. You may know this sausage as kielbasa, kovbasa, klobasa, kolbasa and kubasa depending on your Eastern European background. Sauerkraut, directly translated from German means sour cabbage, is finely shredded cabbage that has been fermented by various lactic acid bacteria, giving it a distinctive sour flavor. 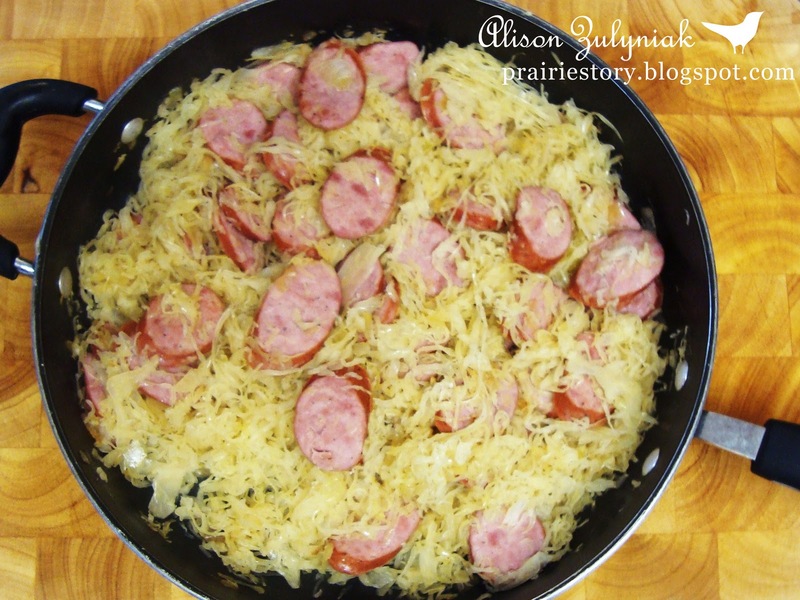 Fry up and combine Kielbasa & Sauerkraut and not only do you have heartburn waiting to happen, but a you have a pretty good little meal. It's also pretty imperative to eat this with some rye bread, even make it into a sandwich if you like, with some mustard (Keen's Mustard is our favorite)! - Cut sausage up sausage into bite size slices. - On medium heat, add margarine to fry pan. - Fry onion, then add kielbasa and sauerkraut. Fry until all starts to brown and sauerkraut is soft. What a great simple recipe. Sounds like something DH would love. If you rinse your sauerkraut really well before you fry it you might not get the heartburn. I love sauerkraut, and it's a regular around our house. I fix it with country style spareribs and mashed potatoes. YUM!! I don't use onion. I do use apple, potato and caraway seed. No heartburn.